Do You Help Your Cerebellar Hypoplasia Cat Eat? How? OK readers, it’s time to sound off. Do you do anything to help your cerebellar hypoplasia eat? What have you found to work the best? 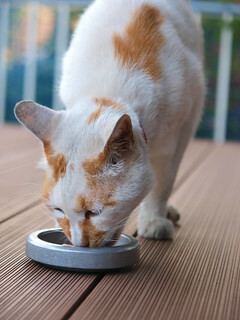 Perhaps you treat your cat like a “normie,” by leaving out bowls of food and water. Perhaps you have a special routine, special dishes, or a special feeding area. Maybe you put mats under your cat’s dishes, or have found ways to keep their bowls from being pushed all around the floor. Or maybe you’ve even created your own feeding stall (like this for kittens or this for adults) for your cats. Please share your best practices and experiences. They may give some other CH cat parents a few other ideas for what may work for them! Looking for some tips for feeding tips? Check out these. I treat Mimosa like a “normie” and leave her dry food/water bowl out all the time. We moved it upstairs (since we baby gate her upstairs in carpeted area) so we put a mat down so she doesn’t get food/water everywhere, which helps a tiny bit since sometimes she can be messy. We did buy the bowls with the rubber on the bottom to help them stop from sliding. It doesn’t always work, but its better than non-rubber bottom bowls. Before we brought her food upstairs to the carpeted area, we found that if we use non-rubber ones, she has fun sliding them all around the floor and causing a big mess. We do feed her a little wet food most days (about 1 oz) but we bought her special little cat plates for that and we feed that to her in a separate area downstairs. We always try to put her food in the same places. We like the plate, since it is small, so she can’t move the wet stuff around too much but it has a little lip on the side so it helps her get it in her mouth if she is having trouble moving it around and getting it in there. If we do wet food in a bowl she gets her face more messy I find. We don’t have an issue with her moving that plate around since she gobbles up the wet food in light speed. We do have to clean up the floor sometimes after her, but she has gotten so much better at eating since we first adopted her (when she used to just peck at her food with her head bob). My CH cat, Etienne (Eshe or Ish for short) is only moderately effected by his condition. He gets around under his own power, even if he falls over a lot of the time. I’ve noticed that when he eats he tends to make a rather large mess of it all. Between tipping his bowl over, landing in his bowl and the chicken pecking he does when eating he tends to get his food all over the place. While it’s sometimes amusing to watch him eat as he does tend to do some rather funny moves, me and my parents were worried that he wouldn’t actually be able to eat enough in any given setting because he has such a difficult time of it. To combat this we did a couple of different things. Firstly; because he does tend to make a large mess of his eating area, we brought out the child playpen that we had stored in a back room that we used to use when my nephew was a baby, it’s a pop-up version and sits roughly about four or five inches off the ground itself (we also did this because we have ornery dogs who love eating cat food). This gives him four semi-sturdy walls to lean against and also prevent him from pushing his food and water around on the floor as we put them up against the corners of the playpen. Secondly; The water bowl is actually a small 5lb. water tank, so it’s heavy enough on its own when it’s full that he has a hard time pushing it to begin with. Granted, he seems to enjoy drinking out of our dogs water bowl rather than his own, which is just a large Glad saver container. He’s actually gone swimming once already, so he might just be a masochist. and Thirdly; The food bowl. We’ve tried a few different types and sizes of bowl to start with, we went small and shallow at first which just ending in him upending the entire bowl all over the playpen. When that didn’t seem to work well, we went with a bit of a larger, deeper dish, which had a 50/50 chance of staying upright as he likes to place his front feet into the bowl with his food and shove his face into it to grab some kernels. As this had a 50/50 chance of staying in the bowl or being turned over, we then switched to a really large bowl (more out of convenience than anything as we already had this bowl) that has a flared bottom that tappers up to the opening. With this bowl he is still able to place his front feet into the dish, but he has yet to actually flip this bowl over (it’s only been in use for a few days, so I’ll have to get back to you all if this seeming progress decides to leave us). I’m not sure if this is something everyone can do, but it’s easy to become creative for the animals we all care about. Everyday things around your home and/or work place could be Jerry-rigged to work for your CH kitty to make things a little easier on them and yourselves, you just have to think outside of the box a little. Hope this helps someone else a bit. I like the weighted Duralit metal bowls with the rubber ring for my cat. I think that’s what the other person was talking about. They are low enough and don’t move around too much. I just started using them for water, too. Poppie has an unrelated (to CH) cervical vertebrae problem from an earlier injury and he keeps really low to the ground. He was knocking over the regular water bowls my other cat uses. I have mats under both the water and food bowls. Even my non-CH cat makes a bit of a mess with the water bowl. I notice he dips his paw in the water first and then drinks it. I have no idea why. We use a large rubber mat (actually, an extra-large doormat turned upside down, rubber side up) to catch spills. Elf (our moderate-severe CH cat) & Pip (a ‘normie’) get fed dry food twice a day in small bowls; that way if Elf dumps the bowl, it minimizes the waste. Water is served in a bowl in a stand next to a wall so it almost never gets knocked over, and she can lean on the wall to drink. Chairman has a massive dog bowl for his kibble that’s very hard to tip over (although he does manage it occasionally). His water comes from a bucket-style water fountain. It weighs about 3kg when full, and he hasn’t managed to knock it over yet. It puts the water at a good height for him too, so he doesn’t have to stoop down. Molly is still too little to feed herself as she cannot balance without support on both sides of her body. Therefore I sit on the ground and place her between my legs for support and hold her chest so that she can eat without wobbling or bobbing. The “bowl” I use for her wet food is actually a small ceramic skillet chachi that my mother-in-law had hanging on her kitchen wall. It is heavy enough that it does not move around on the floor, especially after a small piece of rubberized rug padding was placed under it . The lip is just the right height so that she can eat without it spilling all over the floor. I also use an old phone book to raise the height of the bowl for her comfort. What is funny is that she is so fastidious about dropping any of her food that she stops eating out of the bowl and will pick up any dropped scraps before going back to the bowl. She still refuses to drink water so I don’t give her dry food except as a treat and then only a few at a time. She now feels included when all of our other non CH cats get regular treats. I was thinking about a water fountain for all of the cats but I am waiting until Molly is tall enough so that she doesn’t inhale the water through her nose which she does when I attempt to offer her water out of a bowl even one that is only 1 inch high. I have to hand feed my ch kitty 2 times a day. I wrap her pate in thin lunch meats…kinda like wrapping a cigarette…and break each piece in 3s…and she eats it from my hand. She wobbles a little bit. She bobs her head. She loves to climb and play with paper balls. She is also the runt of the litter. She’s very cute and gives licks and kisses. hello I need some help with my new CH kitten. I adopted my kitten a few weeks ago, and noticed she was wobbeling and had problems keeping her balance, I went to a free vet that the adoption center advised me to go to, and they said I should have her put down that she wouldn’t live. hours of frustrastion and tears my hard headed self went to another vet who wasn’t free in fact $390 worth of blood work and poop tests etc. everything came back normal. she was under weight though and she tested positive for CH. I wasn’t worried about the CH because I think its super cute and adds personality and im looking to get another CH kitten soon. before I dio that I need some brands of cat food to fatten my baby up, shes not gaining any weight!!! I keep water and dry food out daily, and feed her wet food three times a day.. she isn’t eating all the wet food I set out but most of it is gone by the end of her eating. HELP ME PLEASE ASAP. I don’t know what to do anymore.